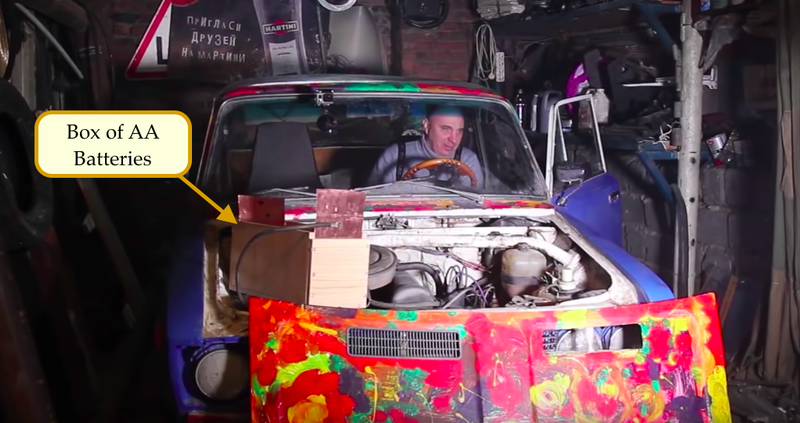 A Russian YouTube host and auto mechanic named Vlad replaced his Lada’s lead-acid car battery with a box filled with over 750 AA alkaline batteries just like what you might find in your T.V. remote. Here’s what happened when he tried starting the engine. Vlad made a rectangular box out of wood, and on the inside attached a copper plate on opposite ends. He then laid down 12 parallel rows of eight AA batteries that are lined up end-to-end, such as the first and last cell in each of the 12 rows of eight made contact with the copper plates. He did this a number of times, yielding a setup with eight layers of 12 parallel rows of eight AA cells. That makes 768 cells if I understand this setup correctly—not quite the 1,000 mentioned in the title of the video uploaded by the Garage 54 ENG channel, but still quite a few. It’s not that surprising that it worked—he lined up the eight batteries in the rows in series to get the voltage potential up (1.5 volts per cell times eight is 12 volts), and he lined up each of the rows in parallel (both side-to-side and up and down—in other words, there are 96 parallel rows of eight AAs, here) to yield enough current to turn the motor over—but nonetheless, it’s a wacky idea that I’d never thought of even trying. The story ends by saying that resistance between the cells means that 200 AA theoretical count could go up to as high as 5,000 cells needed to turn over a car. Vlad seems to have proven that it only takes 768 to start a vehicle—and to do it multiple times, to boot. Not bad, especially since the volume of all of those cells combined really isn’t that much bigger than a regular lead-acid cell. Still, from a cost standpoint, it doesn’t make much sense, since a typical AA battery costs about a quarter. Multiply that by 768 and you’re looking at a $200 battery that’s gigantic, and wasn’t designed for this type of use.